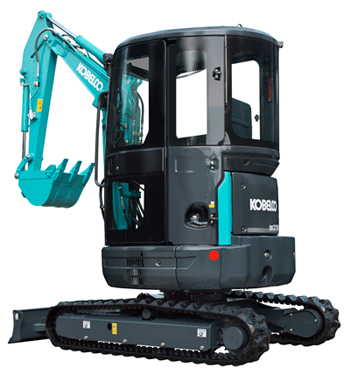 Kobelco Construction Machinery introduces three new mini-excavators - Kobelco Construction Machinery Europe B.V.
ALMERE, April 30, 2014 – Kobelco Construction Machinery Europe B.V. (KCME) is pleased to announce the arrival of three new mini-excavators to market. The new Japanese-built SK27SR, SK30SR and SK35SR extend and complement the existing wide range of specialist earthmoving and construction excavators available from the growing European Kobelco dealer network. Each of the three machines feature an exceptional new dozer blade design to reduce over-spill during levelling operations. The added benefit of a boom offset function allows the arm to traverse across the front of the carriage for parallel digging along trenches or wall boundaries. Coupled with zero tail swing (0 mm overhang) – a Kobelco-inspired industry standard – all three machines are among the most compact in class and perfect for tight, challenging work conditions especially in an urban environment. The SK27SR, SK30SR and SK35SR also feature triple-oil pump technology (IFPS – Integrated Flow Pump System) to ensure continuous and refined digging, travel and load performance. Ergonomic cab controls, positioned for ease of use, fully exploit the available performance with refined and precise control. Performance, reliability and easy service assistance come as standard with the latest Yanmar large capacity engines. Clean and powerful operating performance also delivers superior fuel efficiency and the desired low-operating cost that is expected from Kobelco. To further ensure operators benefit from Kobelco design and experience, the safety cabs have been revised to give larger working interiors and a wider front viewing area without compromising external dimensions. Easy routine maintenance, extended service intervals and a European spare parts back-up complete the Kobelco experience.